RBS recently began searching for an Executive Director for our school. If you are interested in learning about the position please refer to indeed.com. You can search for the position and confidentially apply directly thru Indeed. Children who are experiencing social problems may appear to have Autistic Spectrum Disorder (ASD), but some of these children fit the criteria for Social (pragmatic) Communication Disorder (SCD). Children with either ASD or SCD often have a corresponding Developmental Language Disorder, which also needs to be considered during the diagnosis and treatment process. The most clearly defining factor between ASD and SCD is that those children who receive the Autistic Spectrum diagnosis show or have a history of restricted and repetitive patterns of behaviors, activities or interests. These might include having difficulty with transitions, lining up toys, extreme focus on a specific topics, etc. Children with SCD have social interaction and language difficulties that are similar to those that kids in the spectrum have without the restricted and repetitive patterns of behavior. The approach to treatment can be similar and should support the social communication challenges of the children in varied situations. It is important to include peer opportunities and teach the peers how to initiate and maintain interaction with children who have social communication difficulties. This provides an opportunity to understand the strengths of friends with ASD and SCD and appreciate them. Stop by and pick up some beautiful flowers for your loved ones! This week is teacher/staff appreciation week. For students with special needs, qualified, dedicated staff is a critical component to the development and overall well -being of the child and the family. This week, we have a special guest blogger. One of our Rock Brook parents shares her appreciation of the staff who works with her child. See if you can follow this: I have a friend here where I live, in Princeton, whose sister has a friend who lives in Australia. My friend told me that, immediately after her sister’s friend gave birth to a child with special needs, a check from the Australian government arrived in the mail. No forms to fill out. No evaluations to schedule. The Australian government understood that there would be extraordinary expenses associated with having a child with special needs, and they were pro-active and generous. Not so here in the US. Ask any parent about his/her experience in raising a child with special needs, and you will hear one harrowing tale after another. (Given the reading audience of this blog, I guess I’m preaching to the choir. Sorry.) My husband and I had our daughter Audrey evaluated when she was still a baby, and she starting receiving Early Intervention services by her first birthday. But we discovered rather late in the game that these public services (speech therapy, occupational therapy, physical therapy and cognitive therapy) were generally inferior to those offered by expensive private practitioners. So, we shelled out some big bucks for supplemental “out-of-network” services. When Audrey was three, Early Intervention ended, and she was enrolled in Special Education through our public school system. The teachers there didn’t know what to do with her. 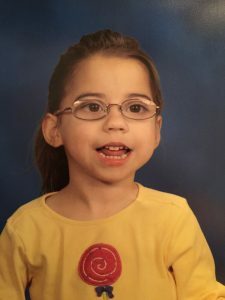 In our efforts to have her placed in a “least restrictive environment,” we ended up with teachers and administrators who were clueless about how to help a child as severely disabled as Audrey is. I spent a stressful and depressing year meeting, arguing, cajoling, and fighting. It was awful. The next year, we placed Audrey in a more restrictive environment, where she was surrounded by other severely disabled kids, and where she was generally ignored for two academic years. What a smile. And as we are completing our fifth year at Rock Brook, the photos still tell the story through her broad smiles. Not that it’s all about the school pictures. Audrey loves Rock Brook, her friends there, and her teachers. Plus, she’s learning! At every Rock Brook parent-teacher conference and IEP meeting, I thank Audrey’s teachers and therapists, and the school’s administrators. I say something along the lines of, “We are so fortunate to have you and this school in our lives. I don’t know what we’d do without you.” And my eyes well up. Even as I write this, I’m tearing up again. The Rock Brook team is knowledgeable, loving, patient, generous, dedicated, selfless, and nothing short of a blessing to our family and to all the families it serves. During Staff Appreciation Week, we can’t show our appreciation enough for all that they do, and the peace of mind that they give us beleaguered parents, who can rest assured that our children are being given superlative educations. Imagine my elation when the school announced its expansion into high school last year. What a relief to know that Audrey can have the benefit of staying at Rock Brook for ten more years. THANK YOU, everyone, for all you do for our precious children!!!!! !